When it comes to muscadine grapes, some enjoy them for their health benefits, some enjoy them for their unique taste, and some love the wine potential. No matter the reason, picking muscadines is an incredibly popular activity around the Southern U.S., especially in North Carolina. Around August or September muscadine grapes usually become ripe for the picking, and not long after, you will see them pop up in farmer's markets, roadside stands, grocery stores, and other locations not only in the South but across America. There are also plenty of places to pick your own to get the best fresh-off-the-vine grapes you can find. In North Carolina, there are grape-growing regions in the West, the Piedmont and central region, and the eastern coastal region. Additionally, most of these farms and vineyards offer other fresh fruits and vegetables, and several have other "pick your own" fruits like strawberries, blueberries, blackberries, peaches, and apples. Each farm and vineyard has different hours of operation, pricing for pick-your-own grapes, and seasonal closures. Do a little research and contact the farm before you travel as some of these farms are relatively remote. Although the mountainous regions of western North Carolina are not the most ideal for grape-growing year-round, August and early September are prime months to visit this part of the state if you're planning on picking your own fruits and vegetables. The top destinations in the westernmost portion of the state—within an hour or two drive of Asheville—offer visitors a chance to pick muscadine grapes. The Piedmont Triad (or the Triad) is a region of central North Carolina geographically located on a plateau that stretches all the way down the Eastern United States from New Jersey down to Alabama. Located between the Atlantic coastal plain and the Appalachian Mountains, this area provides perfect conditions and nutrient-rich soil for grape production, meaning there are plenty of opportunities for you to pick your own if you are visiting this part of the state. 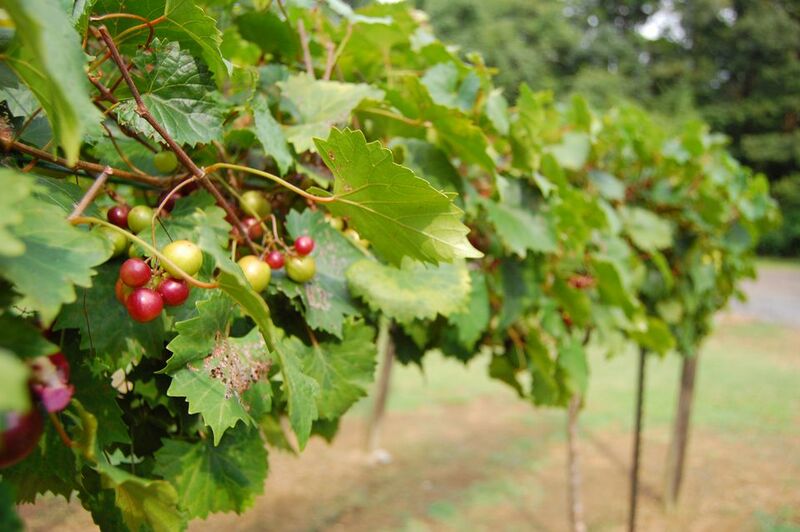 There are numerous farms and vineyards in the Piedmont and central region that feature pick-your-own muscadine grapes. Due to its humid, warm climate, the eastern coastal region of North Carolina is great for muscadine grape crops, which means the area is full of vineyards and farms that carry these delicious fruits. If you're planning a late summer vacation to the beach, you can also stop and pick-your-own muscadine grapes.